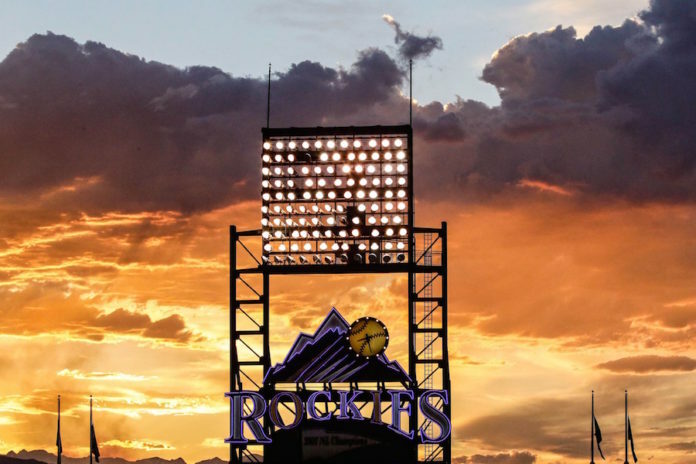 Has it really been nearly 10 years since the Colorado Rockies went on that magical run that culminated in the club’s first National League pennant? In an anniversary series, Rocktober Revisited, we’re looking back on how the Rockies fared throughout the 2007 season. It’s a month-by-month look at what transpired to lead Colorado to the World Series and a special place in the sports memory banks of everyone in the Mile High City. Perhaps it’s fitting that the Colorado Rockies ended April 2017 with a 16-10 record and atop the National League West. Because 10 years ago they were the mirror opposite. As baseball turned the calendar on the first month of the 2007 season, the Rockies sat in dead last in the NL West with a record of 10-16. 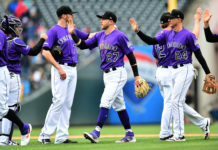 Clint Hurdle‘s Rockies played the role of the cardiac kids as early as the first game of the season, when they dropped a heartbreaker on Opening Day to the Arizona Diamondbacks. Colorado carried a 6-5 lead into the eighth inning on the back of an average but effective start from Aaron Cook. Brad Hawpe went 3-for-5 with a pair of RBIs and Jeff Baker homered for Colorado, but LaTroy Hawkins could not hold the lead in the eighth. Arizona score three runs in the inning to hand Colorado an 8-6 loss. The Rockies bounced back to win the next two games of the series, including a walkoff win in the bottom of the 11th inning the next day courtesy of Chris Iannetta (and an error by Alberto Callaspo). Troy Tulowitzki scored the winning run after doubling to tie the game. Colorado’s fate would be decided four more times that month in walkoff fashion, including twice in the next series at San Diego. Colorado took the first game of three against Bud Black‘s Padres, but San Diego claimed the next two. Manny Corpas was the victim in the ninth on April 7, and Hawkins was again the culprit one day later. 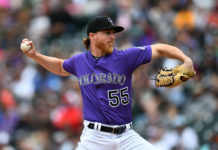 Jeff Francis picked up his first win of the season as Colorado continued a nine-game NL West road trip in Los Angeles, but the Rockies would go on to lose the next two, plating just one run in both games combined. The Rockies would win one and drop two in their next series as well, at Arizona. 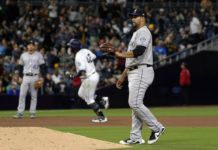 Upon returning to Coors Field they split a pair with the Giants, then lost two of three to the Padres to close out a string of 19 consecutive division games to open the season. When the NL West dust had settled on April 22, the Rockies were 8-11 and in last place in the division. One spot above them was the Arizona Diamondbacks. The two teams would go on to finish the season in first and second in the division. In the final week of the season Colorado dropped two of three to the Mets at Shea Stadium and another two of three to the Braves at Coors Field. Both the Mets’ and the Braves’ series featured walkoff endings, with the Rockies coming out on the positive end against Atlanta. In New York, Ryan Speier allowed a leadoff walk to come around to score in a bizarre finish that included a sacrifice bunt, a balk an intentional walk and a two-out bunt for a base hi to bring home the winning run in the bottom of the 12th. Matt Holliday, one of the biggest players in the Rocktober run later in the year, had two clutch hits in the penultimate game of April against the Braves. It was sweet redemption for Holliday, who had twice grounded into double plays to end innings earlier in the game. He had a run-scoring single in the bottom of the ninth to help Colorado come back from a two-run deficit. He then hit a two-run in the bottom of the 11th inning to win it. April ended on a down note the next day when Josh Fogg, who would later come to be known as “The Dragon Slayer” for his big wins over some of the league’s best pitchers, dropped a decision to Noah Lowry in San Francisco. The Rockies intentionally walked Barry Bonds three times in the game; he would go on to lead the league with 43 in what was his final season in the majors. For the month of April, Colorado pitchers combined for 241.1 innings and compiled a 4.49 ERA, allowing 24 home runs. The offense had its least-productive month of the season, scoring just 106 runs and hitting just 12 home runs. All of it put them in the NL West cellar on May 1, a place they would remain for another full month.